Sitting on a beautiful bay, backed by the stunning peaks of the Tramuntana mountains, Puerto de Soller (Port de Sóller in Mallorquí) is one of the prettiest resorts in all Majorca. There are two beautiful sandy beaches spreading on either side of either side of the picturesque port, and this spectacular stretch of coast is dotted with enchanting coves. 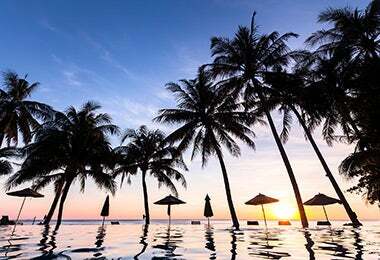 The resort is well served by restaurants, cafés and bars, but retains its relaxed, laid-back appeal. With our cheap holidays to Soller, you can go hiking or biking in the mountains, visit a host of pretty, historic villages and towns, or head into the gorgeous Majorcan capital of Palma, about a 40-minute drive away. The main attractions of Puerto de Soller are undoubtedly its beautiful beaches, enclosed by craggy headlands. The town is arranged around a yacht-filled harbour, where boat excursions depart for tours around this magnificent coast. Nearby, you’ll find Deia, one of the prettiest villages in Mallorca and Soller, with narrow streets and charming squares, and Valledemossa, which boasts a magnificent monastery. The Serra de Tramuntana mountains have a network of superb hiking and biking trails, including the GR21 Ruta del Pedra Seca (‘Dry Stone’ route). A 40-minute drive – or a ride in a vintage tram and train – will bring you to the enchanting capital of Palma. Puerto de Soller has a huge choice of places to eat and drink, whether you’re looking for something cheap and cheerful or want to splash out on a romantic seafood dinner by the port. The traditional Majorcan cuisine is based on fantastically fresh local produce: wonderful seafood, lots of delicious vegetables, and locally reared meat. You can tuck into a traditional paella, or one of the other amazing Mediterranean rice dishes, or have some freshly grilled grouper or John Dory. Or go for some tumbet, a classic Majorcan vegetable dish made with aubergine, potatoes and red pepper. The local cheeses and embutits (cured sausages) are the perfect fixings for picnics. Puerto de Soller is one of the best resorts on Majorca for family holidays in 2019 if you’re looking for sun, sea and sand. The fantastic beaches are family-friendly, and your kids will happily build sandcastles, splash in the sea and perhaps bob about in the bay on a pedalo. Children will also enjoy the boat excursions that depart from the port – older kids might especially appreciate the boat trips that include snorkelling and swimming stops in some of the loveliest local spots. There are lots of family-friendly cafés and restaurants, and plenty of gentle walks in the area that kids might enjoy. Hiking, cycling, golf, tennis, canyoning, climbing, water sports… come to Puerto de Soller and all these fantastic activities await! The coast is a superb destination for snorkelling and scuba diving, with a host of local suppliers providing equipment rental, courses and excursions. You can also rent sea kayaks to explore the hidden coves and sea caves, or perhaps have a go at paddle boarding or sailing. The town has its own tennis club, and there are a number of excellent golf courses within easy reach, including one that is just 15 minutes away by car. The beautiful Tramuntana mountains are crisscrossed with fabulous hiking and mountain biking routes, and you can also go climbing, canyoning and even paragliding. The two beaches in Puerto de Soller are divided by the port, where yachts and fishing boats bob side-by-side. The largest beach is the Platja d’en Repic, which has golden sands dotted with parasols and sunbeds. Popular with families, it shelves gently, and offers lots of amenities, including lifeguard posts and beach bars. The second beach is the Platja des Traves, which is located right next to the port. It also has sunbeds and parasols for rent, and you can also rent pedaloes for the kids. If you’ve got a car (or are exploring in sea kayak), this stretch of coastline has some extraordinarily beautiful little coves, including the little Cala de Deia and the famous Cala de Sa Colobra. Puerto de Soller is a lively and vibrant resort, but the vibe is relaxed and laid-back. There are lots of bars, pubs and cafés, including some with fabulous beachfront settings. There isn’t much in the way of big clubs, but that’s the way most visitors like it. If you’re looking for serious nightlife, hit Palma, which has some fantastic clubs and a huge choice of other night spots. If you’re in town for one of Puerto de Soller’s festivals, you’re in for a treat: celebrate with the locals, enjoying the processions, street parties, concerts on the squares and food stalls. Puerto de Soller is ideal for couples, if you’re looking for a relaxed holiday in the sunshine. The resort is small enough to be intimate and low-key, and large enough to have plenty of shops, restaurants and cafés. Its setting is spectacular, arranged around a gorgeous bay with the beautiful peaks of the Tramuntana providing a stunning backdrop. If you love walking, you can enjoy everything from gentle strolls around the clifftop paths to some serious mountain hikes. There are romantic sunset sailing excursions that depart from the port, or, if you simply want to bask in the sun, you can rent a sunbed on the pretty beach and top up that tan! There are lots of historic towns and villages within easy reach of Puerto de Soller. Among them is Deià, an enchanting village of honey-coloured stone where the writer Robert Graves (author of I, Claudius among many other books and poems) once lived. His home is now a delightful museum. You could also visit the famous 15th-century monastery in Valldemossa, where George Sands and Chopin once wintered, and which now contains interesting exhibits on the town’s history. Also nearby is Miramar, a 13th-century monastery that was later the home of Archduke Luís Salvador, and which enjoys spectacular mountain views.